The shipping industry is subject to a unique demand and supply mechanism that makes the market very volatile and exposes ship owners and shippers to a number of risks, one of which is freight rate risk. Owners naturally aim to control freight risk in an effort to secure constant earnings from a vessel. One method to reduce freight risk exposure is to take opposite positions in a corresponding paper trade. This is known as derivative hedging and features the ship owner placing a bet on the downside of the market; i.e. falling freight rates. That way one hopes to mitigate the losses incurred in the physical market (spot) with the gains made on the hedge. 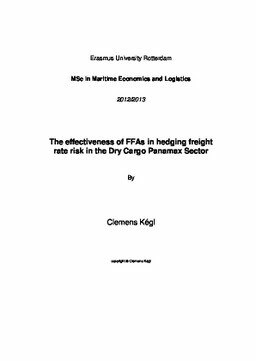 The hedging tools analyzed in this study are future contracts, namely forward freight agreements (FFA). They are priced through an index reflecting future prices of the underlying market to be hedged and can be short sold, because they are cash settled. The downfall of BIFFEX contracts has shown that the effectiveness of FFAs as hedging tools depends on how well the indicating chart reflects the physical market. Indices are often composites of a number of routes or ship segments and eventually lack representing accuracy. For modern Panamax FFA contracts the relationship between spot and future prices is tested statistically using regression analysis. The results show high correlation between the plotted variables, suggesting that much of the variance in the physical segment can be explained by developments on the future market as well; hence there is high potential for hedges to be effective. The issue of effectiveness is elaborated further, also with respect to other factors, such as counter party risk and a lack of liquidity in a market. The latter of which is an issue in today’s shipping environment, which experiences a reduction in the number of people willing and able to trade FFAs. No matter how well the index represents the market, there always has to be somebody acting as counter party. Nevertheless, although liquidity risk may arise from the quality of a FFA, it may have other origins and may not be used to judge hedging effectiveness as such. The overall opinion is that for the sector handled (Panamax) and for the viewed route composition, FFAs appear to be very effective risk minimizers. But ship segments are much diversified and may not all show similar hedging results. Further, the spot rates are averages received from routes between world regions that consider a range of ports on either side. Therefore, the true effectiveness for individual routes (port-to-port) may only be assessed by further refinement of sailing distances.